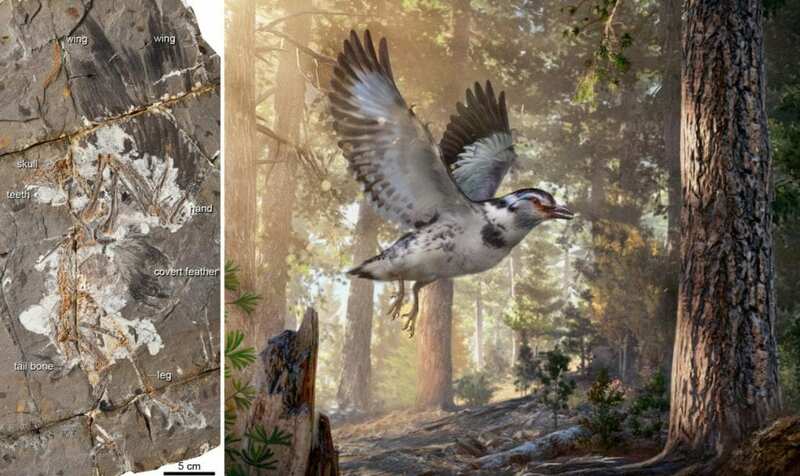 The analysis of this early Cretaceous fossil shows it is from a pivotal point in the evolution of flight – after birds lost their long bony tail, but before they evolved a fan of flight feathers on their shortened tail. The fossil's shoulder joint also gives clues about its flight capacity. In flying birds, the shoulder, which experiences high stress during flight, is a tight joint between unfused bones. In contrast, Jinguofortis perplexus preserves a shoulder girdle where the major bones of the shoulder, the shoulder blade (scapula) and the coracoid, are fused to one another, forming a scapulocoracoid. The existence of a fused shoulder girdle in this short-tailed fossil suggests evolutionary variety during this stage of evolution, which probably resulted in different styles of flight. Based on its skeleton and feathers, Jinguofortis perplexus probably flew a bit differently than birds do today. Measurement of the fossil's wing size and estimation of its body mass show that the extinct species had a wing shape and wing loading (wing area divided by body mass) similar to living birds that need a lot of maneuverability. These traits would have helped it fly in the dense forests of northeastern China's Cretaceous period.